Want to know how I opened a Gym with over $450,000 in revenue and 250 clients on Day One? had to Pay a Cent. Six years ago, I opened my first gym. I was ecstatic beyond belief. It had been a long-held ambition of mine, but what I did at the beginning of my journey would’ve been scoffed at by any sane person. So the gym doors opened up but I had nothing to show for it. Financially, I had to struggle week to week to keep things afloat. I had to live in the gym, as I couldn’t afford to pay the lease plus house rent, my car was sold for cash, and I was doing every task required to keep a business running all by myself. To make matters worse, I had the marketing experience of a brick. In hindsight, I should’ve done a better job of preparing myself for the realities of business. Things started to get better after a while. The gym was starting to fill up, and I was getting tonnes of referrals given I was consistently delivering results to my first few clients. As word-of-mouth grew, so did my business. Money-wise, it was a blast. However, I quickly discovered a problem with my business model, as more and more people came to me, I realised that the business could not scale past a certain point. The referrals, while saving my business, were single handedly strangling its potential, and I was struggling to find a sustainable solution. What was the solution to this seemingly Catch-22 problem? Over the next five years, I managed to open 13 more gyms, with few hundred thousand dollars per location in revenue and some mentors under my belt to show for it. My mission: to develop the perfect strategy to open up each new gym, but not just any gym. I wanted to template the strategy to open up a gym at full capacity with up to 250 paying clients on the very first day of operations. And guess what… I did. 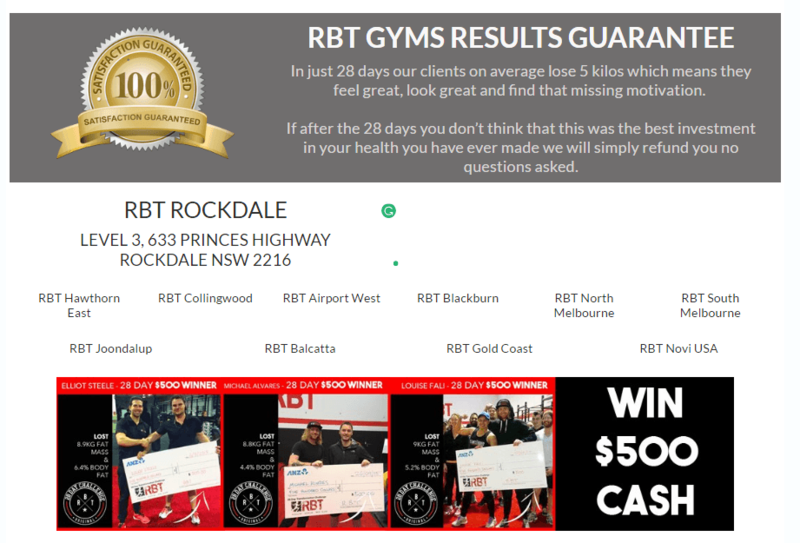 The latest RBT location has brought in over $450,000 in revenue within the first 35 days and still going strong as of today. In this post, I’m going to break down the exact things that I did to achieve my goal into 3 simple steps without costing a single dollar. I will walk you through each and every step in detail. It does not matter what industry you are in, these steps will fit your particular business and hopefully elevate your business to the next level. 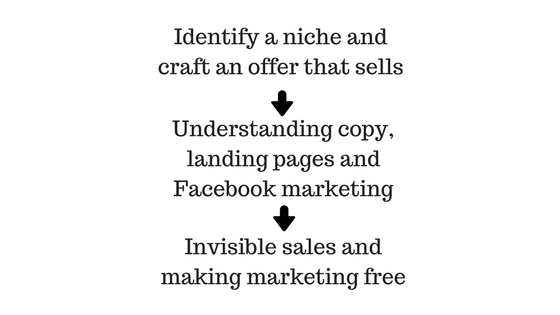 Here’s an overview of the 3 steps. One of the most crucial things in marketing a business is crafting offers. Think of the last time where an offer or sale made you purchase a product. 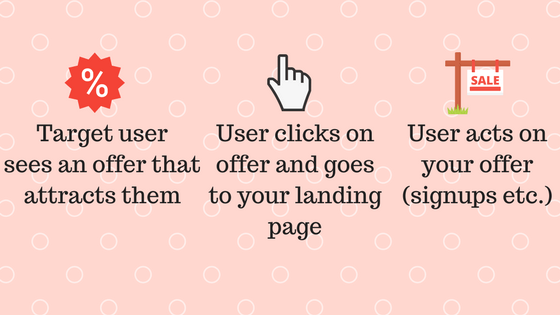 We want to achieve that by making an offer that makes your target users go, “Hey, I want that”. What we are aiming for in opening a fitness business or a business in general, is to plug our offers and marketing efforts on Facebook. Despite Google’s enormous ad network, it is primarily based on search terms and often times there are not enough search terms for businesses (particularly newer ones) to properly promote their businesses in a particular area. We are looking at attention-based marketing on a marketplace to a niche demographic, which is enabled by Facebook’s massive user information database as well as their laser targeting marketing features. The first thing to do is to research your niche market to find your ideal target market. For instance, if you’re catering towards men and women, that’s two different markets. If you’re targeting women aged 25-30 and women aged 30-50, that’s already two different markets in addition to the ones that you had earlier. Once you’ve got that figured out, you need to ask yourself these 4 questions to increase the likelihood of crafting an offer that sells. What does your target market really need? 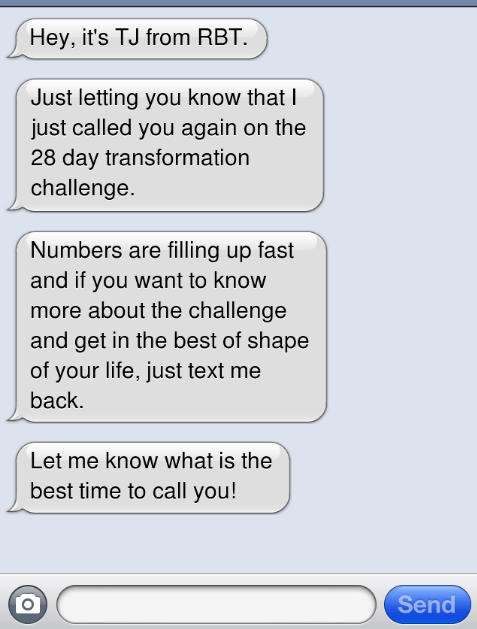 Let’s say that you are running a fitness business. Do they need to lose fat for health reasons? Do they need to train harder for an upcoming marathon? Do they need to recover from an injury? Discovering what your target market really needs brings you one step closer to achieving success in your offers. Do they want washboard abs to flaunt off during summer? Do they want to reclaim their flawless physique from their youth? Do they want to build up more muscle mass or Do they just want to be the strongest man alive? Do they want cheaper membership fees? 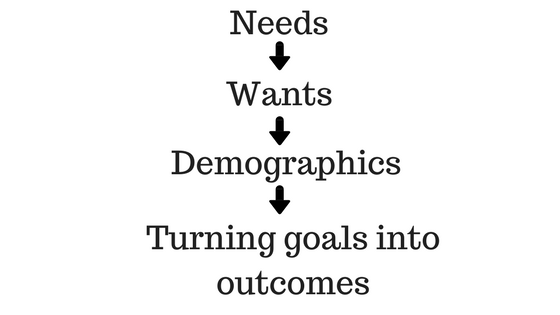 Once again, this is a crucial step in identifying your target market’s characteristics. Is your target audience in close proximity to your local business? Are they from high-income groups or do they earn below-average wages? Do they spend most of their time at work? 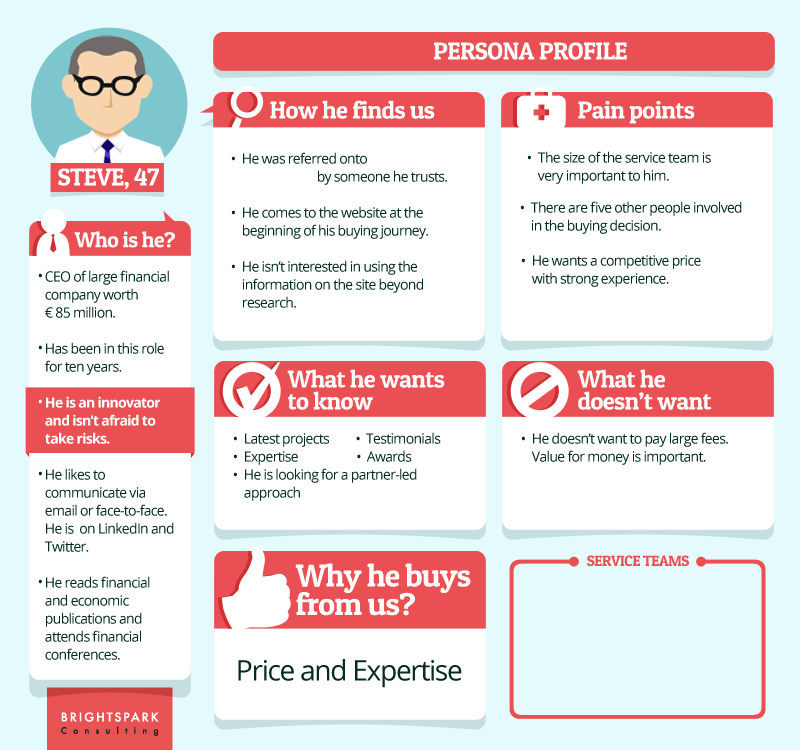 The infographic below describes the things that you need to have a proper understanding of your target market. What goals and outcomes do they have in mind? Maybe they want to lose 10 kilos in 6 months or run a marathon in a faster time. This step is important as we are selling the outcomes of their efforts with our offers. I’ll explain that in detail in the following section. Now that you’ve got everything that you need to know about your target audience, it is time for the big question. What can I offer to my target market that’s going to take them off Facebook and onto my website? This is where your core offer comes into play. A core offer is what your whole business is built around and provides your target market with an outcome that is desired by them. To put it in layman terms, a core offer allows your target user to reach an end goal that they want to achieve. For instance, the core offer of your fitness business is a 90-day body transformation program. The outcome of this offer is very clear as it aligns with the wants and needs that we’ve uncovered before which is to have a healthier body, lose fat and what not. You can’t just market your $2000 core offer on Facebook out of nowhere. In fact, you’re probably going to burn through your marketing budget in no time with no significant returns if any at all. People that are going on Facebook are not going to look for body transformation programs or offers of that sort. That’s for Google. Do you go on Facebook to search for tips on how to lose body fat? Neither do I. People are also never going to spend thousands on your high-ticket product based off one ad that they saw on Facebook. Once again, would you spend a huge chunk of your precious savings on a single ad that you saw on Facebook about staying healthy? Snap a small piece out of your core offer and market that instead, which brings us to our elegant business model. 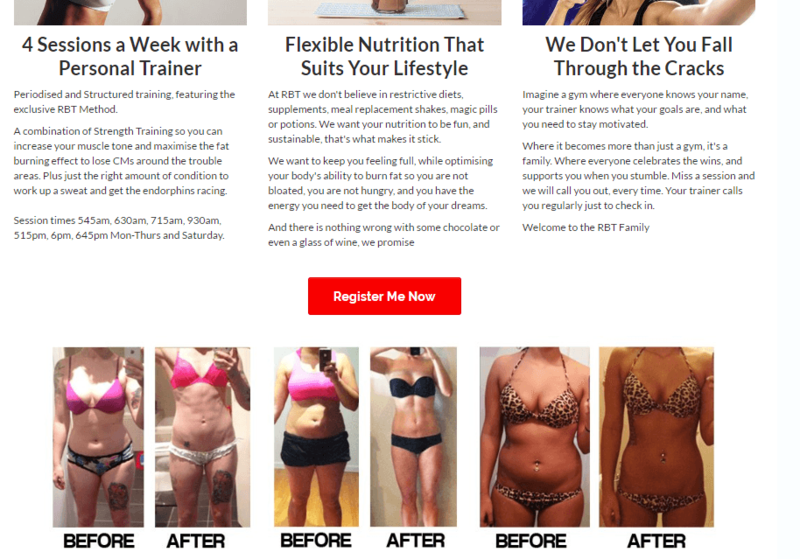 Instead of marketing a $2000 core offer on Facebook, why not offer something like a 66% discount on a $291 3-week body transformation program? Wait a minute, am I not losing money by offering this kind of deals? Definitely not. At $97 for a 4-week program, that’s a fantastic deal for your target audience and that’s exactly what we did to get 250 clients before we’ve even opened our gym doors. That’s the results of our elegant business model, which shows you why it’s crucial to snap off a piece from your core offer and create an irresistible offer for your own business and target market instead of advertising your high-ticket products at the start. What are the characteristics of an irresistible offer? Now that you’ve got the first step of the strategy done, it is time to move on to crafting Facebook ad copies and landing pages that convert well. While great ads do play a part in increasing conversions, landing pages carry a significant portion of the burden. 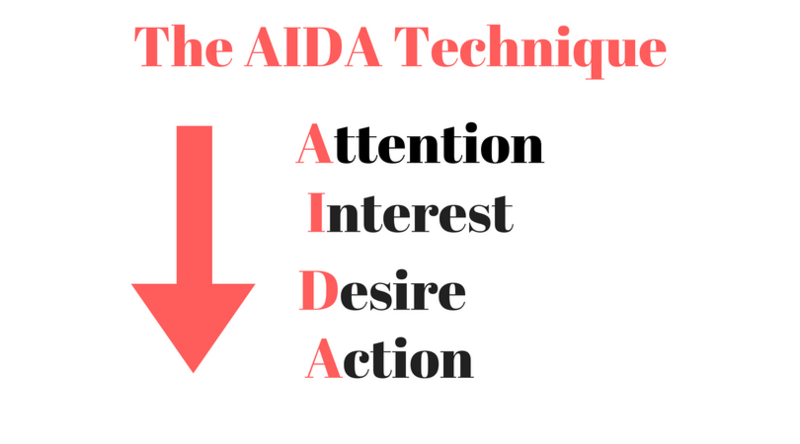 There are tons of excellent copywriting techniques and formulas for landing pages out there, but we’ll specifically focus on the AIDA technique which was the format that brought us massive success in our campaigns. This part of the principle can be likened to calling your target audience out. What we are aiming for is to capture their attention and there’s no better way to do that than directly mentioning them in our ad copies. A simple way to do this is by combining your target demographic and the location that your business is in for instance; “South Melbourne Women!”. You can also do something like “Want to be fit but gyms are too expensive?” for example. As long as it is specific and is related to your target market’s needs and wants, you’ll definitely attract their attention to your offers. Why are pain points so powerful in driving interest? First of all, including pain points in your copy makes your offers relatable to your target audience. They feel like you understand what their problems are, and that you are genuinely willing to help them solve their problems. Furthermore, people tend to run away or overcome their pain to the path of pleasure. Do you have troubles losing stubborn belly fat? Do you wake up feeling lethargic and uninspired everyday? Do you feel like working out but just don’t know where to start? This is where pleasure comes in. How do you provide pleasure to your target audience? You do that by including their desired outcomes that were discussed in step 1. List the benefits that would be derived from participating in your offer such as before and after photos of previous participants for instance. Do you wish to lose 5 kilos in 2 months? Do you wish to lose your love handles in a month? Do you want to have a leaner body in 4 weeks? All the steps above would be meaningless without including a call-to-action. A call-to-action is something that persuades your readers to action with the most basic and universal call-to-action being the “Click Now” link on your ad copies. You can improve the effectiveness of your call-to-actions by including time-sensitive descriptions (From now till the 25th of….) or by including irresistible offers (Click now for a 10% off on all services). Be creative! The following are actual ad copies that were run by us on Facebook. As you can see, our ads were clearly written with the AIDA principle in mind and it has paid off very well. After a reader clicks on the call-to-action link, they will be led to a landing page. This is where you will convert your target audience into leads. Here’s how our landing page looks like. If you’ve noticed, the headline and sub-headline mimics our previous ad copy. The headline once again calls out our target audience, while the sub-headline includes the desires or pleasures that were listed beforehand. We’ve also included the phrase “28 Day Challenge” in the sub-headline, because people want to achieve things fast. Remember the “Fast Consumption” step in the guide to crafting an irresistible offer? It’s never a bad idea to include that in your landing page. A video is also included beside the sign-up form. Videos are meant to further facilitate user engagement, and they’re going to make your target audience feel even more comfortable as videos are social proof that what you’re offering is valuable to them. A photo will do fine as well but remember to use the exact same photo that you used in your ad copy. We’ve also included a countdown timer to instill a sense of urgency. Once the timer runs out, the offer is gone forever. No one wants to feel like they’ve lost out on a valuable offer, so this will further increase our engagement rate. The signup form is self-explanatory, but it’s crucial to figure out what you need from your target audience before you have a signup form. In our case, we only need a name, e-mail, and phone number. I’ve seen so many landing pages doing poorly because there are too many fields to fill! Do you like filling in lengthy forms? Neither do your target audience, so try to keep your signup forms as basic as possible. As you scroll down our landing page, you’ll notice even more desires and outcomes listed. We make sure to include every possible benefit that we can provide to our target audience so that they will feel more inclined to partake in our program. The before and after segment is also another powerful tool in persuading your readers to take action. Not only do these provide value, they also serve as a way to remove any negative thoughts or doubts of your target audience. There’s nothing scarier than having to go through terrible restrictive diets in fitness programs, and we eased that fear by explicitly stating our flexible diet requirements. We’ve included our money-back guarantee in our landing page. Why? Don’t we lose money that way? First of all, we are very confident in the outcomes of our program and you should feel the same about your own offers. Secondly, implementing a refund guarantee reduces the risk of your target audience. How is this important? You would not spend a dime on something that is risky to you, and that’s what we’re trying to mitigate here. You’ll help your target audience feel less doubtful about spending their money as well as establishing your business’ trust and reputation. If they do ask for a refund within the time period, don’t be an arse about it and honor their requests if it is within the policies of your money-back guarantee. This applies to everything that you do in your business, don’t be a jerk and you’ll get good results. Make sure that your website is fully responsive and adapts to screens of mobile devices and tablets. Like it or not, a huge part of website traffic nowadays comes from mobile devices. Therefore, don’t try to skip out on this as you’re going to lose a lot of potential leads from not having a mobile responsive site. With the ad copies that we did along with the landing page, we were able to generate a tremendous amount of signups on our campaign. Here’s the proof. Remember how I talked about generating over $450,000 in revenue while essentially making marketing free? Here’s how I made it happened. First of all, I had an irresistible offer for my campaign but more importantly I also had a self-liquidating offer. Self-liquidating in this sense simply means that the “cost” of my marketing paid for itself through the signups that I got for my offer, essentially making my marketing free. Not having a self-liquidating offer is why tons of people are afraid of marketing, as they are worried that they might lose out on a lot of money without generating any sales or ROI. They spend tons of money on Facebook ads, AdWords and other PPC campaigns, but they don’t really know what their returns are or what they are supposed to measure which leads to poor management of their marketing budget. So, what actually matters in a Facebook campaign and why should you care? Here are the metrics to measure and a brief description of each metric. For irresistible offers, the average CPV based on Facebook ads will be in between $1-$2, but for simplicity’s sake we’ll take a price of $1 per visitor as a benchmark. We would like to have a page conversion rate of 20%, with 10% being the minimum. With a PCR of 20% as a benchmark, for every 5 visitors that land on my landing page, 1 of them will signup for the program. With a CPV of $1 as mentioned earlier, the total cost of getting one lead (or signup) is $5. This is the best-case scenario of an irresistible offer. Let’s take the worst-case scenario as an example. What if I have the minimum 10% PCR and a CPV of $2? For every 10 visitors that go on my landing page, 1 of them will signup. With a CPV of $2, the total cost of getting one lead (or signup) is $20. Now, $20 is 4x the total cost of the best-case scenario. But, you have to keep in mind that we are marketing an irresistible offer. What happens if you market a core offer instead? 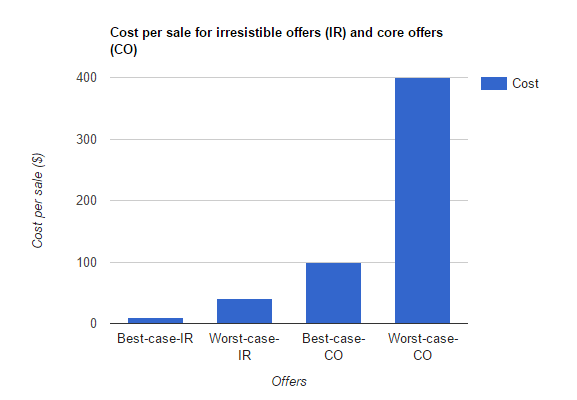 The average PCR for a core offer is in between 1%-4%, which is a huge difference from our irresistible offer PCR. In the best-case scenario for a core offer, you will have a 4% PCR and a $1 CPV. In 100 visits (because you don’t have enough signups for a sample size of 10), you will get 4 leads at a total cost of $200. The average cost per lead is then $50. This information may be tricky to digest, so I came up with a graph to prove my point. As you can see based on the graph above, running core offers can be stupidly expensive! That’s why you’re losing a lot of money on marketing. 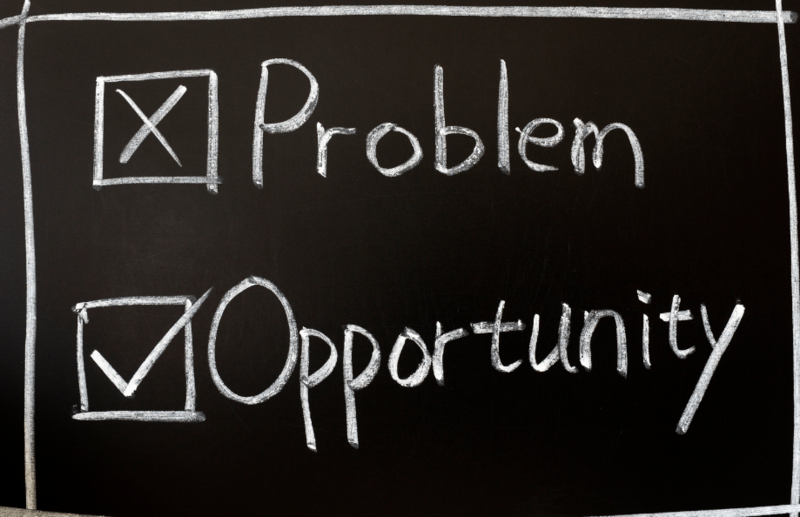 Marketing issues do not arise solely because of poor offers, but more to the fact that you are trying to pitch a high-ticket product the the cold market who have virtually no interest and know absolutely nothing about you or your business. The way to break into a cold market is by running irresistible offers, which directly leads to higher conversions and lower marketing costs. It’s in the word itself, irresistible! People don’t like to lose out on valuable opportunities, so they feel that they cannot lose out on this offer which leads to higher click-through rates. For an irresistible offer, the worst scenario is that we sell 1 out of 2 signups, or a 50% conversion rate of leads who turn into paying customers. It’s best to try and bump the rates up to 70%, but 50% is good for now. 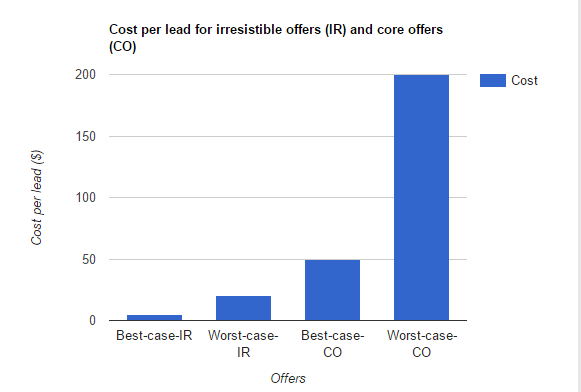 From our previous calculations on irresistible offers, the cost-per-lead (CPL) for a best-case scenario is $5 while the CPL for a worst-case scenario is $20. That means that it would cost us $10 and $40 to make a sale respectively. I’ve mapped a graph with the cost-per-sale of the core offers included too. For the core offers, acquiring a sale cost a minimum of $100, which is a lot of money frankly speaking. In our case, running core offers would cause us to lose money! In our case, we did a $97 dollar offer as you can see on our landing page and ad copies. That’s how we got our 250 paying members for our gym. In total, we made approximately $25,000 out of the 250 clients and we actually paid $9,000 in marketing for the offer. Essentially, we got paid to market and our customers were acquired for free. We had an ROI of almost 3x our initial spending and we haven’t even taken into account the ROI of the $450,000 that we generated within 35 days. 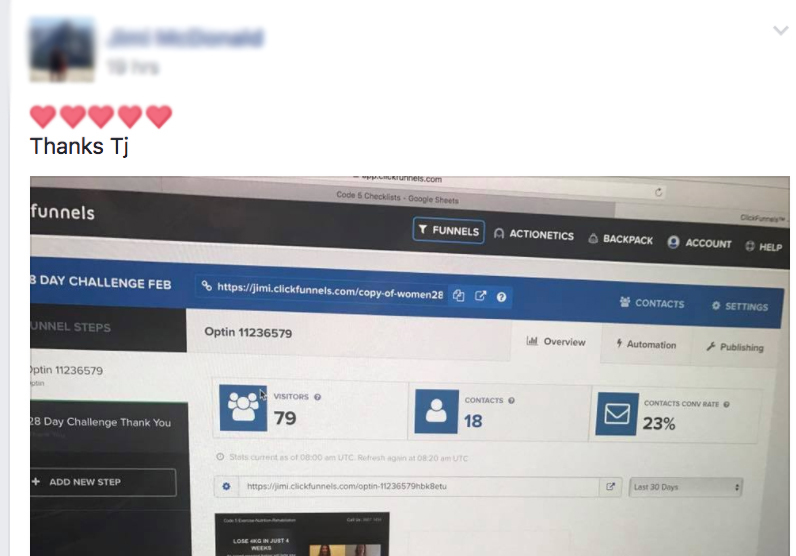 The photo below is a screenshot of our total marketing costs and the engagements that were generated from our Facebook ads. Each time that we made a sale, we process our payments through Stripe and we got our money on the day itself. Before Facebook could even bill us in 48 hours, we’ve already had the money from our clients to pay Facebook. This is how marketing is free. 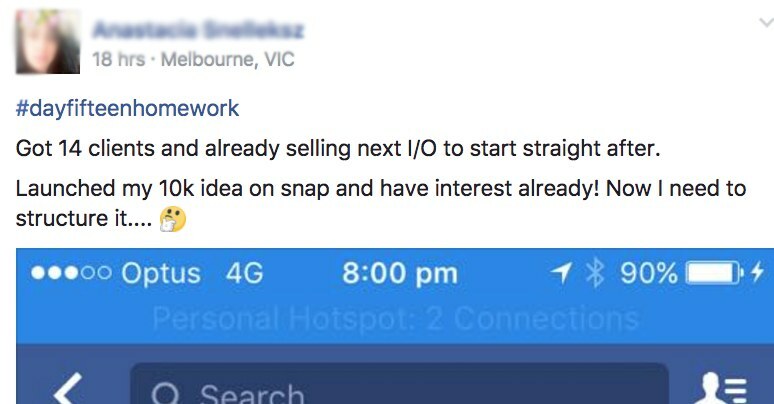 You’re making sales before you’re even paying Facebook! This can only happen if and only if you manage the metrics mentioned earlier and have a good understanding of what your costs are. In a nutshell, an irresistible and self-liquidating offer is all you need to keep your marketing free forever. Contrary to recent beliefs, phone sales is not dead if you know what you’re doing. How did we get so many paying customers by using the phone despite only having 450 leads? We call our leads 3 times a day. If they don’t answer our calls, we’ll send them a text because logically no one’s going to answer a call from numbers that they don’t know. Here’s a mockup of how our texts looked like. Are you harassing someone or are you trying to change their life in the best way possible? Personally, I’m going to call the person and text the individual until I get an answer. I’m going to help them as much as I possibly can because fear and insecurities tend to arise in people along the way. You’ve got to help them break through that mental obstacle and let them know that you are here for THEM! You have the ability to change their life and you don’t stop until you get a definitive answer, be it a yes or a no. Displaying your passion and empathy is a surefire way to generate more sales and clients for your business, but never ever try to fake it. People can spot dishonesty from miles away, so make sure that your efforts are genuine. 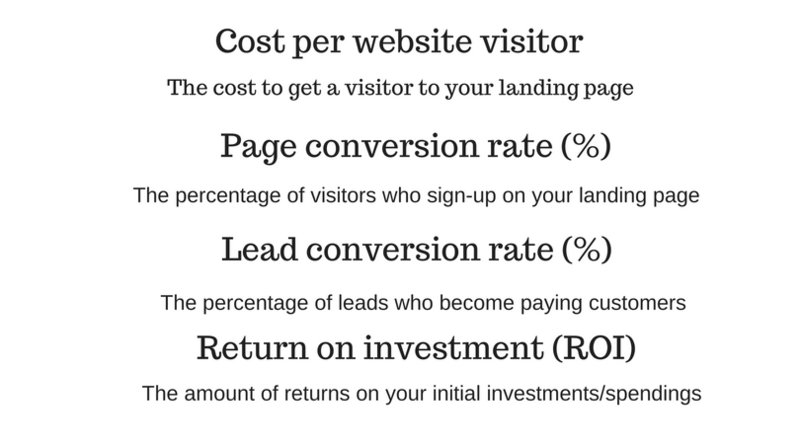 So, here’s a checklist to convert your leads into paying customers. Do these until you get an answer. Forget about how good you are at closing or the “art of selling”. That is NOT the psychology of sales. It is instead about the art of helping. Over here at RBT, we don’t care about the amount of sales that we make, we care about the people we let down. These people reach out to us in hopes that we improve their quality of life, to increase their confidence, to make them feel energized! What happens when we don’t make the sale? Hence, you should always fight for the sale not because of the money, but for them – the people who reached out to you for help. You help them by overcoming their objections, make them feel better about their decisions and never ever fail to deliver on your promises. When you help your clients, make a conscious decision to give 110% percent in your efforts. Help them with all your might because these are the people who are putting dinner on your table. Building rapport has always been a powerful tool in all forms of communication. When you call your clients, don’t go in with a sales mindset. People can feel that you are desperate to make a quick buck off of them. Call them just like how you’d call a mate. Ask them how’s their day going! More importantly, ask them questions about their life that is related to what you’re offering them. What were their biggest concerns about going to the gym? Did they enjoy working out? You need to provide the details of your program to the person that you are calling. To put it simply, people need to logically understand your program and be emotionally invested in it. Remember this, people buy with emotions most of the time. Ask them questions about the program. Have you done something like this in the past year or so? On a scale of 1 to 10, how important is this program to you? How important is having a healthy body to you? When they answer these questions, they will start to realise that they need this program and they will slowly sell themselves to you. All you have to do is reassure them that your program can help them achieve that. Make them feel certain that your program is the right choice for them and make sure that they know you want the very best for them. An orientation is done to help with your upsell and invisible sales which will be discussed in a while. In our case, we discussed the nutrition, training, and timeslots of our 250 clients to make sure that they are a perfect fit. While the orientation part may not seem like much, I’ll tell you why it’s so important and how it helped us to get over $450,000 in revenue in the following section. We did seminars for our 250 initial clients in groups of 60. 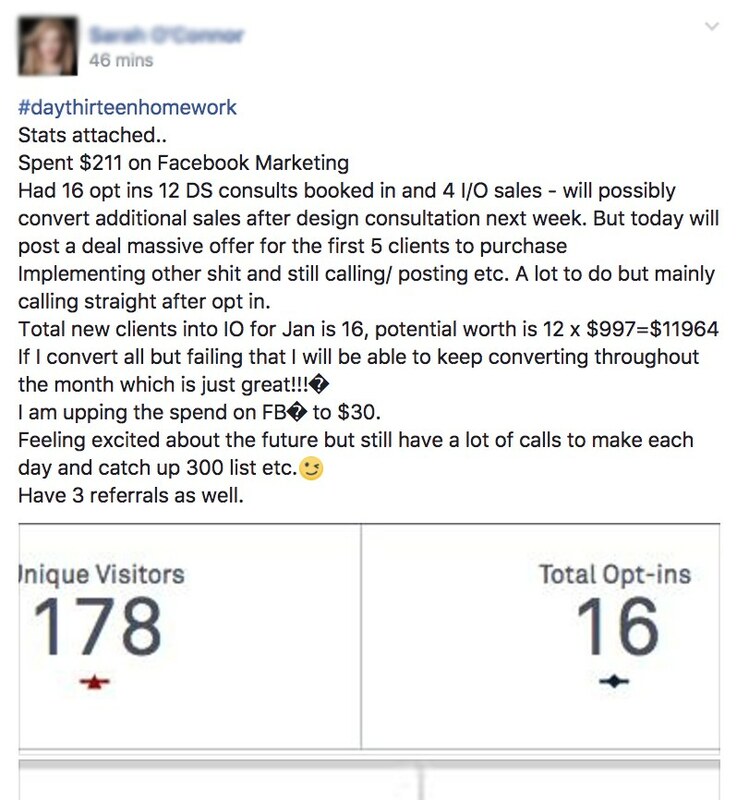 While the previous techniques were crucial in attaining our first batch of clients, this part right here was how we generated $9,000 of recurring revenue weekly without even needing personal sales consultations. We did this by having a goal-setting program of 24 weeks which got our clients emotionally-invested as they understood that we were trying our best to help them in achieving their desired outcomes. With the seminars, we also positioned ourselves as the authority in the niche that we were in which drove further commitment from our clients. Thank you for reading my guide on how to get 250 clients and over $450,000 in revenue for free. Before you leave, we have a special offer just for you. 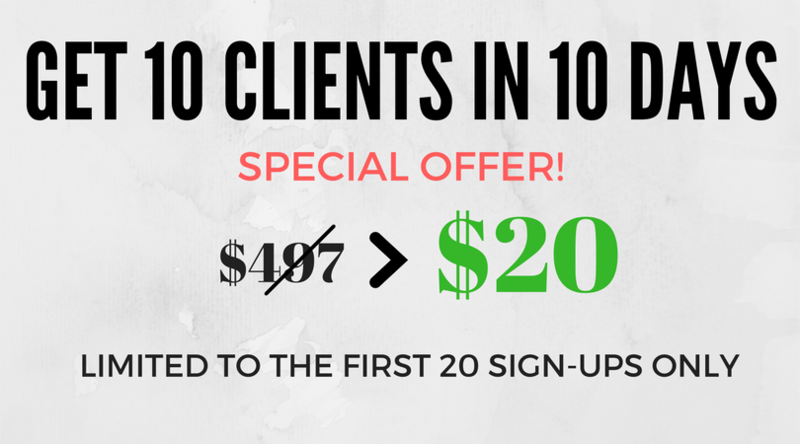 We’re providing an individual program tailor-made for you on how to get your first 10 clients for your business at a ridiculous rate of $20! Ready to change your life and elevate your business to the next level?